The latest musical rendition of Les Miserables or "The Miserables" has drawn a number of praises although for non - musical viewers would not appreciate this movie at all except for the presence of the A - List Hollywood celebrities. Les Miserables is a historical French novel by Victor Hugo published in 1862 and has been considered as one of the greatest novels in the 19th century. While I may be ignorant of original novel, my liking for music and for superb actors and actresses compelled me to watch the movie on the big screen. Good thing though that I finally watched the film and swept off because of its excellent musical scores and dialogues. I bet high - end musical technology had made the musical drama more effective. 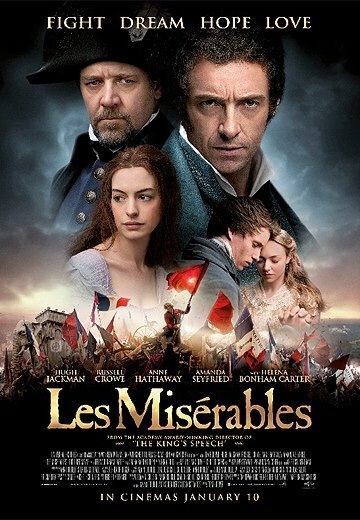 Les Miserable had clearly depicted the drama of the early French revolution and the crisis that crippled the society. Having it clearly rendered through music is a a work of a total genius. This movie along with the works of musical Phantom of the Opera and Mama Mia are magnificent works of art and music. Now, that I finally know the plot, I shall soon find time to read the entire novel to visualize fully the plot.